Since Ant McPartlin was revealed to be divorcing wife Lisa Armstrong last month, it’s been rumoured that he and I’m A Celebrity and Saturday Night Takeaway co-star Scarlett Moffatt have been ‘dating’. However, within a recent Instagram post, the former Gogglebox star put speculations to bed by revealing she is, in fact, seeing someone new boyfriend – and it isn’t Ant. Just last week, fans were gobsmacked when the 27-year-old posted a mirror selfie on her social media profile, in which a cosy snap with Ant was spotted by eagle-eyed followers placed next to her bed. ‘Look a picture of Scarlett and Ant in the background,’ one fan wrote on the post as another added: ‘If this is with Ant’ as well as ‘Ant be on the prowl tonight’ (sic). ‘Ant by any chance?’ another said, while another also commented: ‘whose that a pic of on your bedside table.’ (sic). 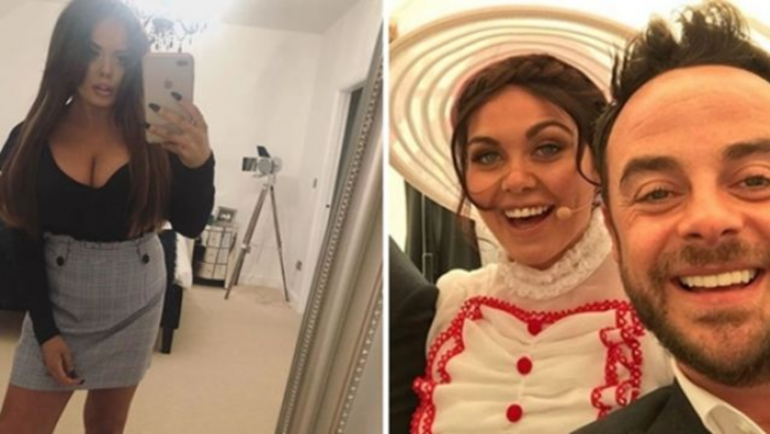 Aiming to hush the rumours of the pair’s alleged relationship, Scarlett addressed the claims and stated that the selfie was, in fact, a snap of the two of them on Saturday Night Takeaway – with herself dressed in a Mary Poppins costume for the grand finale in Disneyworld, Florida. Many supporters of the Geordie star jumped to her defence and said that she has every right to keep her personal life private, should she wish to: ‘You shouldn’t have to explain. Silly comments from narrow-minded people!’ one angry user commented. ‘Leave the poor woman alone, she has her own life and dates who she wants to. Who she sees, what she does and what she looks like is none of anybody’s concern! Keep as you are Scarlett you’re an inspiration to us women.’ another fan said. Ant’s manager also went on to acknowledge the rumours, suggesting it was all “total bull****” and added that Scarlett has always admitted that the presenting duo are simply her professional ‘heroes’. It was also alleged that Scarlett and former Love Island winner Kem Cetinay had been dating in recent weeks. Kem, who is currently competing in the ITV show Dancing on Ice was stitched up by ex-girlfriend Amber on social media in light of the rumour after Scarlett was spotted sitting next to Kem’s best friend Chris Hughes in the audience. It seems Scarlett has no romantic feelings towards either Ant or Kem, as she revealed the name of her new love interest via social media recently. Sharing a mirror selfie on Instagram, she captioned the photo: ‘Date night with Lee Wilkinson’, followed by a heart emoji. Lee Wilkinson is a stripper currently on tour with the Dreamboys show and the pair were said to have met for the first time last summer. The 27-year-old split from ex-boyfriend Luke Crodden in October last year and prior to that was in a short-term relationship with Ian Billett in 2016. At the time of the split, Ian told The Mirror the reasons why the relationship ended, despite having only been together for two months. Admitting it was his choice to call-it-quits, he said: “She didn’t take too kindly to it at the time. It was my decision and it was the right thing to do for both of us. “It sounds like I’m a softie but her career was really starting to take off and she was being invited all over the place, the door was just opening for her. I have two jobs, a mortgage and my life is very settled. I thought we were at different places in our lives and it was for the best for her that we split up. Meanwhile, her most recent boyfriend Luke also decided to end things at the worst time; by choosing to break her heart on her birthday last year. However, Scarlett told the press that it was simply due to the fact they viewed each other in more of a ‘friendly’ way than romantically. At the time, Scarlett announced the news of the split on social media: “I’m gonna have to write it because I feel a bit awkward as I’ve done some interviews about him being in my book that aren’t out for a while due to timings of the magazines … but me and Luke have finished due to a number of different things. “It was Luke’s choice in the end but it’s because we both just see each other in more of a friendly way than a romantic way. We both respect and love each other enough to know we need to call it a day and not be one of those couples that’s off and on. “So it’s not that I’m being a crap girlfriend and not mentioning him it’s just we are no longer together, I wish him all the luck and happiness in the world, just sometimes these things happen.